Emerson Electric (EMR) has raised its dividend for 61 consecutive years. This makes the company a Dividend King. The Dividend Kings are a small group of companies that have at least 50 years of dividend growth. You can see all 25 Dividend Kings here. There are only four companies with more years of dividend growth than Emerson. A company that can raise its dividend every year regardless of economic conditions is one that income oriented investors should consider owning. This article will examine Emerson’s business model, growth prospects, recession performance and valuation to determine if now is a good time to buy shares of this Dividend King. Emerson supplies industrial equipment and products to more than 150 countries around the world. Emerson consists of two business segments. Automation Solutions, which accounts for approximately 60% of sales, offers products that help businesses run their operations with less power and expense. Products in this division help measure temperature, allow facilities to run on automation and help detect cracks in pipelines. The Commercial & Residential Solutions is responsible for the remaining 40% of sales and offers products that help businesses run smoothly. Products include HVAC, refrigeration and security and monitoring systems. Emerson has a current market cap of almost $46 billion and has sales of more than $15 billion in 2017. Emerson has been in business since 1890 and employees almost 80,000 people. Emerson reported first quarter earnings on February 6th, 2018. Excluding a benefit due to tax reform, Emerson earned $0.58 per share. This topped analysts’ estimates by $0.03 and was 3.6% above earnings per share for the first quarter of 2017. The company grew revenue 18.6% to $3.82 billion. This was $100 million above expectations. Aside from the Europe and Middle East/Africa regions, Emerson saw growth in every region that it does business in. China sales were especially strong, growing 23% year over year. Automation Solutions grew a robust 31% while underlying sales grew 9%. Energy-related markets did very well in North America. Excluding the company’s acquisition of Valves & Controls, margins for this division increased 120 basis points. Commercial & Residential sales were flat year over year. Sales in North America were up just 1%, but China saw growth of 24%. This strong growth in China was due to high demand for air conditioning, heating and refrigeration products. 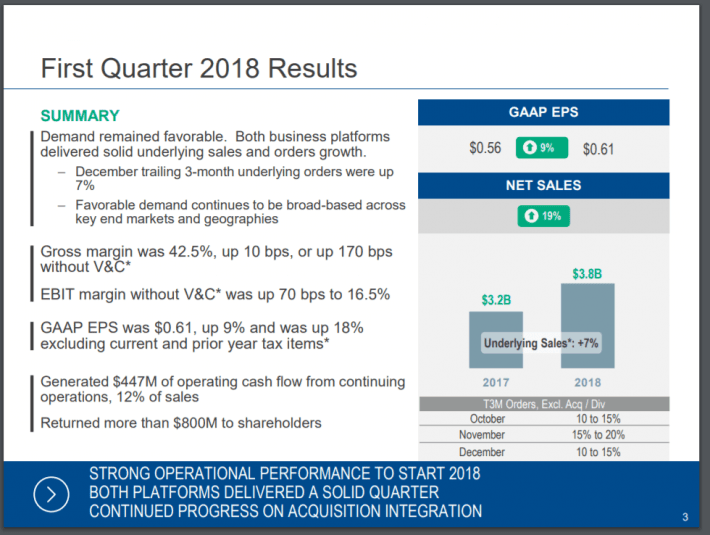 Management expects both divisions to see solid growth in 2018. Like many companies, Emerson will benefit from tax reform going forward. The company expects a tax rate of 25%-27% for 2018 and around 25% going forward after this year. This is 5% below Emerson’s historical tax rate. Because of growth in its business in the first quarter as well as tax reform, the company issued updated guidance for 2018. Emerson now expects to see underlying sales growth of 5%-7% in 2018, with both Automation Solutions and Commercial & Residential growing middle single digits. The company sees earnings per share in the range of $3.05-$3.15. Even without the added benefit of tax reform, the company would have seen 5%-13% EPS growth from 2017. Net sales should also improve handily in 2017 as well. The company is starting to see growth ramp up and that should excite shareholders. Also exciting is that Emerson is guiding towards cash flow of almost $3 billion. This is 24% higher than the company’s cash flow for the last fiscal year. Companies with increasing cash flow can increase its dividend and buyback more shares. The company was very shareholder friendly during the quarter, repurchasing 7.8 million shares. Between dividends and share buybacks, Emerson returned $800 million to shareholders in the first quarter. Emerson got through the Great Recession with just one year of earnings per share decline. Industrial companies’ sales and earnings are often tied to the health of the economy, so Emerson producing these results is impressive. Perhaps of greater concern is how Emerson performed during the most recent decline in the price of a barrel of oil. Since 50% of sales are exposed to the oil and gas industry, let’s take a look at how the company performed when the price of oil collapsed between 2014-2016. As the price of oil collapsed from a peak of $115 in June 2014 to $35 in February 2016, Emerson saw its sales decrease significantly. Energy related products for the company’s largest division, Automation Solutions, accounts for 70% of sales. Since Automation is expected to play an important role in Emerson’s guidance for 2018, investor need to be aware that a significant decline in the price of oil can have a material impact on the company’s financial performance. Now that oil has rebounded above $60, Emerson has seen growth for its energy related products. While the figures aren’t what they were prior to the decline in energy prices, it does seem that sales have hit a bottom in 2016. The company is expected to deliver double digit growth in 2018 so sales are trending in the right direction. Emerson has an impressive dividend growth streak. Six decades of dividend of increases is no small feat. Shares have increased more than 20% over the past year, dropping the current yield to 2.7%. For most of the past year, Emerson’s dividend yield has been above 3%. Emerson’s dividend growth has been modest over the past few years. The average raise over the past five years is just 3.6%. The company has given shareholders just a 1% raise each of the past two years. Perhaps given the pain inflicted on Emerson from the oil decline, shareholders should be happy to receive a raise after all. The company is expecting a higher level of cash flow in 2018, so higher dividend growth could occur. According to ValueLine, Emerson is expected to generate earnings-per-share of $2.80 in 2018. Based on the recent share price of $72.38, shares of the company are trading at a price to earnings multiple of 25.4. 5% earnings per share growth before tax reform. Shareholders can reasonably expect to see a return of 7%-8% this year based on pre-tax reform EPS guidance and dividend yield. Emerson has very few peers when it comes to its dividend growth history. More than six decades of growth has made the company a Dividend King. First quarter earnings showed growth in both divisions of the company. Emerson is also forecasting strong earnings and sales growth in 2018 even without the added benefit of tax reform. While the multiple might not expand from current levels, EPS growth and dividend yield offer investors a nice return going forward.